I've been doing plenty of research and I think I have the basics of all the preperation needed, nutrition (I work at a grocery store, so plenty of treats for my budgie every day), and day to day care. I still will probably be posting here regularily for advice on things I'm not sure about. However, my big question right now involves the great outdoors. I like to go on walks to get in shape, lose weight, and generally because I enjoy exploring and sightseeing. That being said, I'd love to bring my budgie buddy with me, and I figure it's good enrichment for them. However, the information on that seems sparse, so I wanted to clear up some here. 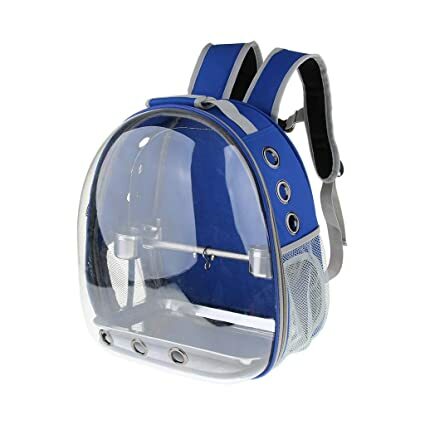 First of all, if someone had advice for a good backpack would be a great start, I've seen a few on Amazon that catch my eye, but I'd love suggestions for ones that work for you all. These two in particular catch my eye. I don't want to go with a cage, I've heard horror stories of Falcons trying to get at Budgies through the bars, and we have -tons- of Falcons in my area, living in the North East of the Americas. This is why I've ruled out a Budgie Harness. Also just about, any other advice you can think of about taking your budgie to see the world some. Thank you for your time and thank you again for the help, hoping to post the pictures of my first Budgie here when I finally get it! EDIT: By the way, forgot to mention, yes I did read the stuckied thread, that's why these are mostly questions that aren't covered by the sticky, sorry, haha. Last edited by Zefier; 03-20-2019 at 07:26 AM. It sounds like a fab idea, but please bear in mind that on your back, a budgie cannot see you, only strange surroundings and potential predators, and there isn't a lot for them to do in there, it could seem like a prison to them. 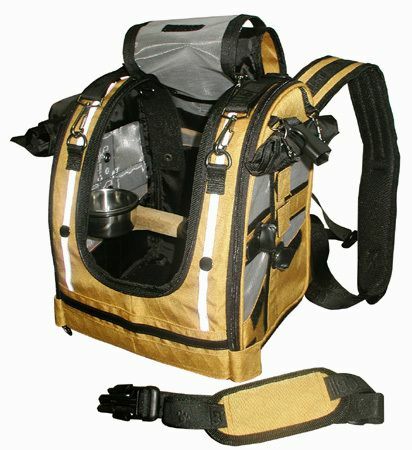 So if I were you I would do shorter walks in the same area, a few times per day, to give the budgie a chance to get used to being in the backpack. Also think of bad scenarios- what if you tripped and fell while the budgie was on your back? This way you can also find solutions. And possibly think about walking in your house with the budgie on your back so that (A) if the budgie escapes he/she is easier to catch and (B) he/she will be in more familiar surroundings. NOTE: I am NOT against this in any way, it seems like an awesome idea, just make sure it's safe!! P.S. Yes, please please please send pictures!! Last edited by #Kiara; 03-20-2019 at 09:03 AM. I may be the only person to say this....but I don't like the idea. There are just so many things that can go wrong, and I'd hate to see your budgie escape or get hurt. Maybe I'm just being overly paranoid, but I personally wouldn't take my birds out for a walk. I agree - these perch backpacks are only recommended for larger birds, since they are often better suited to travel in a backpack. Budgies are so tiny and fragile that it's incredibly easy for them to get scared or stressed. For a wee bird would be trapped inside the backpack whilst you walk around - which bumps and jostles them, because they are so small - would be more a stressful experience than an enjoyable one. To take your budgie outdoors, it would be best if you took them in a secure cage into your yard or porch while you're there to supervise for a little while, if they enjoy that. I agree with PoukieBear and StarlingWings. The backpacks are meant for large birds - not for a tiny budgie. I would never recommend using one. Instead, take your budgie for short outings in your yard or on a covered porch safely secured in its cage and supervised every moment. it is absolutely heartbreaking. Enjoy your walks and come home to tell your sweet bird about your adventures. Thanks again for all your help everyone, I'll take it all to heart, no outside rhomps for my Budgie, except in a very supervised cage maybe. Thank you again for all the advice, I did finally get the Budgie! Techno! They should have their own page in "New Arrivals"
The Pak-o-bird and backpack is not recommended for small birds. So we say no to this idea. While you might think it’s great, Budgies usually will be stressed by going in an unfamiliar enclosure in an unfamiliar world. It is more popular for larger parrots who are tame and bonded to the owner and are used to this type of stimulation and not afraid, as an alternative to the old school way of sitting on a shoulder while out and about. Budgies, NO. They don’t have the demeanor for this. Glad to hear you've decided against the backpack! I'm off to check out new arrivals to see Techno!